To race the European ITU Triathlon championships, you need to qualify at one of the British Triathlon’s 3 designated races. 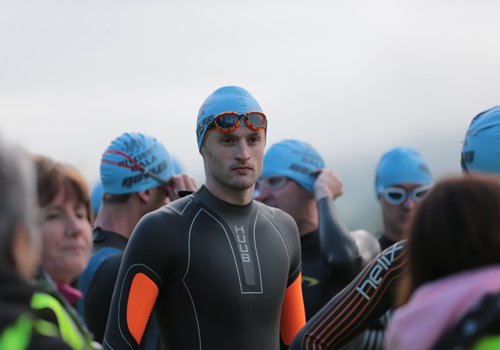 After injury and making the decision to withdraw from my race at Eirias Middle Distance Triathlon (having completed the bike section) at the start of August, I was hoping for a trouble free race at the Bala Standard Distance Triathlon. I have raced here numerous times before and it always draws a top quality field – due to the prize purse. This year, the winner was Liam Lloyd, who represented Wales at the Commonwealth Games. That gives some idea of the nature of the competition! Bala also hosted the final European Standard Distance qualifier of 2014 and that was one of my two aims from this race, to qualify for the 2015 European Champs and also to better my time from 2013. On arrival, there was a dense layer of fog over the lake. Not uncommon for this to occur at Bala, I wondered if the start was going to be delayed. Whilst queuing to get into transition, the fog suddenly lifted and the sun was out. The water temperature at Bala is always chilly. This year it was the highest I have ever known it to race in, a tropical 16 degrees. The water still felt pretty chilly! I got a good placing on the start-line (front row) and a positive start. I was swimming in a group of around 6 athletes and it was working well. I didn’t feel especially great in the water, but was quite pleased with my time considering how I felt, 20:22 for 1500m. It was out onto the bike and I was soon into a rhythm and head tucked in. The out and back course is quite deceptive. There is quite a tasty climb after the turn, so I made sure I saved some energy for this. The beauty of riding with power enabled me to maintain a consistent effort. This meant those that shot by on the climb (expending lots of energy) were soon reeled back in on the flat and downhill. By the end of the bike section, I still couldn’t feel my feet! This would make for an interesting run. Jumping off my bike, I performed one of the fastest T2’s of the day. Starting running was tough, especially with no feeling in my feet. I could tell my best running legs weren’t with me. Nevertheless I ploughed on. About two thirds of the way through the run, I finally regained some sensation in my feet and managed to pick up the pace. I crossed the line and claimed a qualifying space for the 2015 European Championships, ‘Job done’. 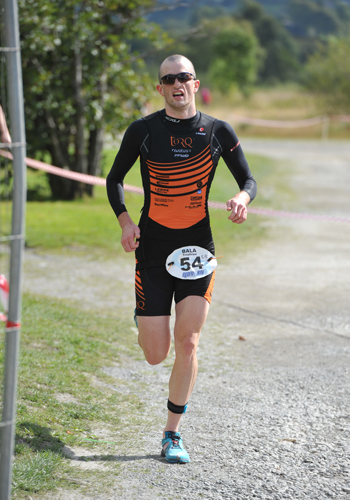 A real positive was that my injury that caused me to DNF at Eirias Middle Distance hadn’t surfaced at all.